Free admission, Free car parking. On sale will be: African goods, Craft goods, Loads of second hand books, games, jigsaws, jewellery, Cosmetics and , of course Bric-a-Brac. Refreshments. Successful fundraising at the Christmas Tree Festival at Littlehampton United Church. A weekend of fundraising: Christmas Tree Festival, Christmas Sale of Everything, African Shop, Concert with the Edwin James Choir, all contributed to raising over £860 for the charity’s work at Unity School. Church members also contributed money to enable the residents of the orphanage to have a special Christmas lunch. Curry Night at Monsoon’s restaurant in Rustington raised £800. Getting the work of our charity into the public eye is an on going task. Attending local Fairs and Carnivals is an important form of communication. Do come and talk to us, or come along and help give out leaflets and talk to others about our work. Other dates will be published soon, including the second Christmas Tree Festival. The Edwin James Choir will be entertaining us with a Christmas Concert after our Fish and Chip Supper. Wath our Facebook page for updates. When we held our “Sun to Slum” exhibition in 2014, one of the highlights was the mock up of a typical dwelling place in the Bombolul Slum.We have now rebuilt this, with more permanent materials, to use at exhibitions and Fairs. Pictures can be seen on our facebook page. The first outing will be at Broadwater School’s Fayre on 24th June and then at various events listed under EVENTS. Thank You to everyone who supported our Great Sale of Everything. Over £830 was raised at this event. We have now received pictures of the new Cookers, these will be in our newsletter to be published shortly. There are more pictures on Facebook. We are still running our two appeals to pay for the cookers and to buy reading books. Hit the donate now button to help. This week should see the arrival of two cookers in the kitchen at Unity School – something different from your usual kichen appliance as each cooker is designed to cook a huge cauldron of either rice or beans. These will relace the open wood burning fire that surrounds everything with smoke. Each cooker will have its own chimney, making the work of our faithful cooks so much more pleasent – and also the surrounding classrooms. We are appealing for your help with paying for the cookers and also buying more reading books for children of all ages. Please note that our registered charity number is 1155625 – see the following artical. Our home page is in the process of development and will show this change. Currently we have 21 needy students being supported at Secondary School. Collins Odhiambo is at the respected Dr Aggrey School, a boarding school five hours by bus from Mombasa. ” My day at Dr Aggrey begins at exactly 4.30am when we are woken up for the morning preps, which takes about an hour and a quarter, then we resume to our breakfast which is tea and bread. After breakfast we go back to our dormitories in preparation for for the normal school routine. It is during this time, about 1 hour that we carry out our duties such as cleaning the compound and our classes. After that we go for another 1 hour prep which starts at 6.40am. In the prep we are guided by our teachers on how to tackle challenging questions and also on non-comprehended areas. We then have a twenty minute break, then the normal lessons begin. We have a break after every two lessons and the last before afternoon classes is the lunch break which is from 12.30 – 1.30pm. We then go back to our class for two hours and then go to games. Everyone is supposed to participate in at least one game, football is my favourite. Collins’ favourite subjects are Chemistry and Mathematics. In his class he is 1st out of 45, and in his year group he is 1st out of 176! His average greade is “A”. We hope he will score sufficient marks in the Kenya Certificate of Secondary Education to win a scholarship place at a university. We look forward to welcoming Mr Joash Obento and Mr Norbert Werre, two senior teachers at Unity School, Mombasa. While Joash and Norbert have been invited to attend a wedding, their visit affords a useful opportunity for Trustees to have a face to face meeting to discuss priorities at Unity School. There will be opportunities for charity supporters to meet Joash and Norbert.At present the following are in the calendar. Sunday 26th July: 6.00pm at Littlehampton United Church. Starting with tea/coffee/cakes and informal worship, Joash and Norbert will be speaking about the difficulties of living and working under threat of terrorist action. Good news from The Foreign and Commonwealth Office means that we can now visit Unity School in ombasa. The last visit was back in January 2014. Three Trustees are planning a visit in August to assist with Tuition with Secondary School Students. Other groups are planning to go in January and the Spring. The Charity Website is in process of renewall. We apologise for the lack of photos. There is more to see on our Facebook pages. Last Saturday’s Silent Auction, held at Rustington Methodist Church raised over £400 towards Charity Funds. 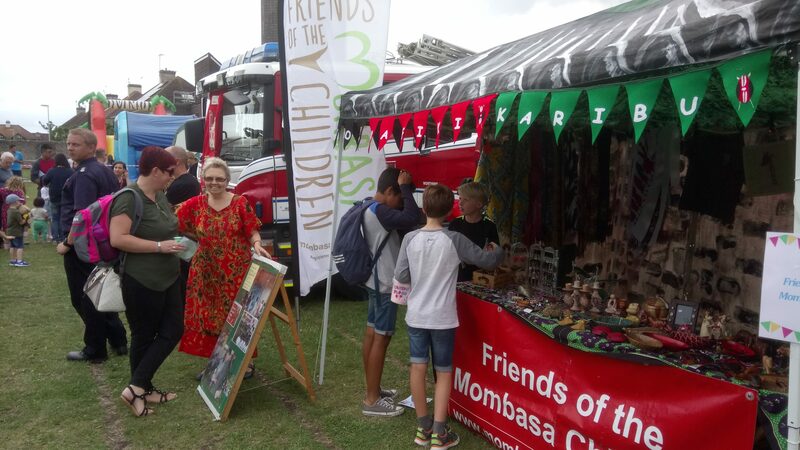 At this difficult time in Kenya, we believe our work in Mombasa is more vital than ever. A conversation with one of our colleagues this week revealed a state of shock that many Kenyans feel after the attack on the University at Garissa. We are convinced that providing good education will not only help lift children out of poverty but remove some of the pejudices between peoples. Thank you to all who have supported us. Saturday 14th March 2014, 7.00pm at Littlehampton United Church Hall. Plenty of Free Parking. There will be a presentation on the latest news and pictures from Mombasa. Over the last four weeks we have been in constant email and telephone communication with the management team at Unity school. The Education Authorities in Mombasa have been concerned about the over crowding at Unity school, and in particular three very small classrooms divided from each other by blackboards. The situation has always been far from ideal. The education authority have now given Unity School an ultimatum, and have said that two new permanent buildings have to be built very quickly, otherwise some pupils will have to go home. The management at Unity School are trying very hard to find funds for school improvements and have managed to do really well in the last year, in particular in making sure those parents who can afford to pay school fees do so at regular intervals. This has given them a small surplus which they have used to start building two new classrooms. However, they are still short of money by around £2,000. Our financial resources were stretched last year, particularly with our medical and feeding programmes, not to mention the rising costs of looking after those pupils in the orphanage who do not have parents or a home to go to. So we are urgently asking for any help our supporters can give us, small or large, it all adds up. We will keep you all posted with this appeal, and pray that we can get these two urgently needed new classrooms built as soon as possible. alternatively, you may donate online by visiting uk.virginmoneygiving.com/charities/mombasachildren. If you can gift aid your donation it will be worth even more. Picture: Kindergarten Class 2 in their new classroom. Can you help us pay for it? Every £1 you give will be matched by one of our supporters.